Enter an URL address and get a Free Website Analysis! the high cost of Agencies. guides for your website type. Additionally we’ll monitor your keyword rankings and improvements, and keep you updated on your site’s performance. Win more customers with a professional SEO Audit, written in simple language that inspires action. Simply upload your logo, add company details and adjust styling to suit your brand. Generate PDF SEO Audits in 20 seconds. White Label SEO Reports are available in several languages including French, Spanish and German, with more being added. Customize reports to your heart’s desire – change colors and fonts. Choose which checks and sections to show, and add custom content for that personal touch. 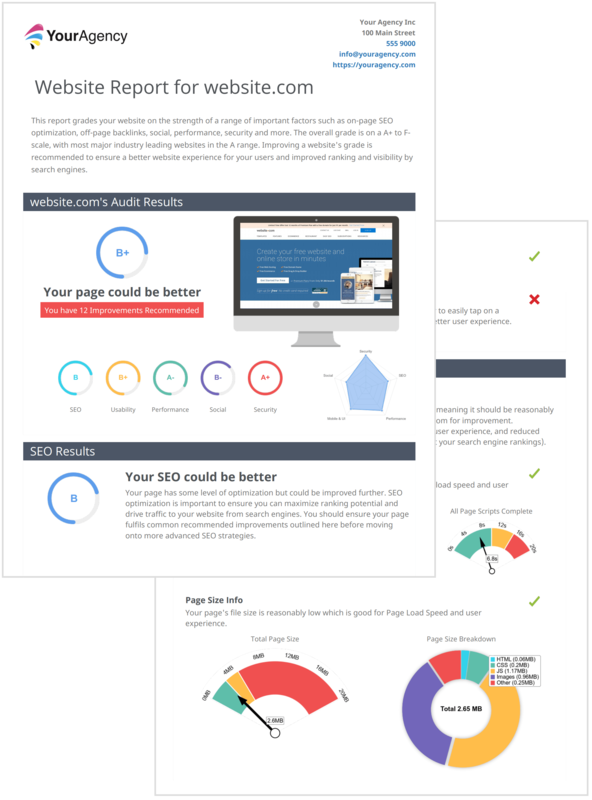 Generate more leads straight from your website with your own Embedded SEO Audit Tool. Simply embed a simple Audit Form that matches your website’s styling and colors. Present customers a beautiful branded audit that inspires action. Get notified of new leads and their details straight to your mailbox. Send your leads and their reports straight to any other CRM, Mail Tool like MailChimp, Active Campaign and Salesforce. ..SEO Experts, Web Designers or anyone that needs to improve a website! Save Time – Some agencies spend hundreds of hours of manual work performing Website Audits which can be automated in a matter of seconds. Present Beautiful Reports – Wow your clients and prospects with impressive bespoke reports that look like they were made by hand. Win More Customers – Turn your site into a lead magnet. Use White Label PDF Reports and the Embeddable Audit Tool to acquire more customers straight from your website. SEOptimer has been a game changer for my SEO business. The setup is so intuitive and quick, beautiful reports, great support and my clients are loving the results. Great tool for quick and simple SEO Audit of any web page. More calls from people with websites that are NOT performing well on Google. Have you ever checked your website #SEO? I love the SEOptimer free online tool - it gives you an easy report of your #website in seconds showing what’s good and bad. Generate more leads from your website today by providing a free report to your customers. 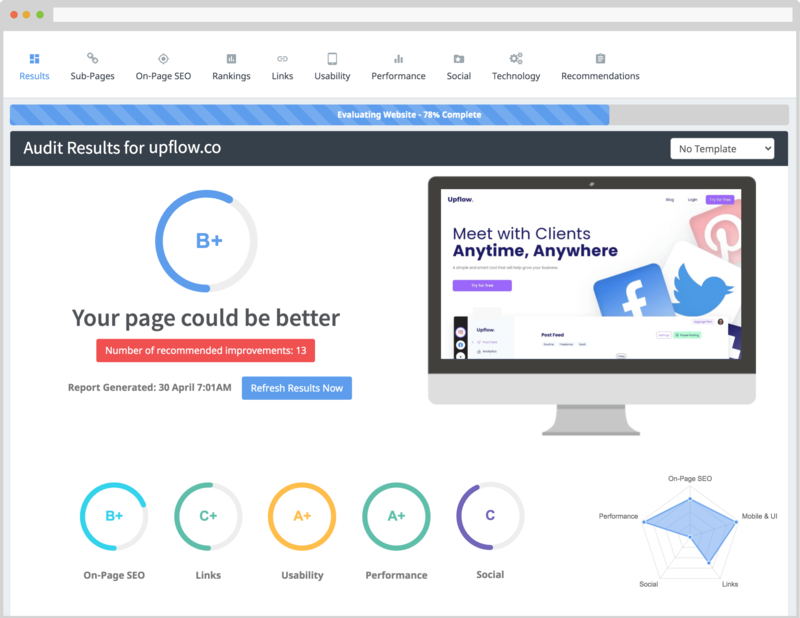 SEOptimer is a free SEO Audit Tool that will perform a detailed SEO Analysis across 100 website data points, and provide clear and actionable recommendations for steps you can take to improve your online presence and ultimately rank better in Search Engine Results. SEOptimer is ideal for website owners, website designers and digital agencies who want to improve their own sites or theirs of their clients. 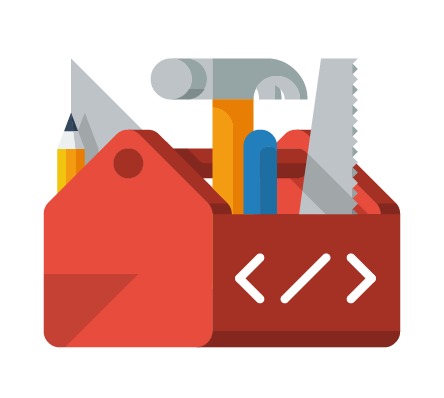 Additionally SEOptimer provides a range of completely free SEO Tools such as Backlink Checker, Meta Tags and Robots.txt Generator which will help take you through the actual steps of improving your site. Last but not least, the SEOptimer blog provides a bunch of relevant articles and tips and tricks for you to stay on top of the SEO improvement landscape. What Are You Waiting For? Try SEOptimer Today! SEOptimer is currently completely free to use.